A planned cut in the number of refugees the U.S. admits is the latest win for hard-liner Stephen Miller, who keeps beating the Trump admin’s pragmatists. WASHINGTON — Days before the Trump administration announced plans to slash the number of refugees allowed into the U.S. to its lowest level in 40 years, Trump senior adviser and immigration hard-liner Stephen Miller made his case for fewer refugees to a room of senior officials at the White House. His sales job was made easier by the absence of top officials who disagree with his stance. They weren't there because they weren't invited, according to two people briefed on the discussions. Missing from the room last Friday were U.N. Ambassador Nikki Haley and the head of the U.S. Agency for International Development, Mark Green, both of whom have promoted a more generous policy toward refugees fleeing poverty, famine and persecution, the two sources said. The planned cut in the refugee cap, now just 30,000 for the coming fiscal year, is the latest win for Miller, who has outmaneuvered opponents in and outside the administration to push through a crackdown on all forms of immigration. Miller's victories on the Muslim travel ban, limiting legal immigration and separating migrant families at the border show his skill in pulling bureaucratic levers, blocking opponents from key meetings, restricting the flow of information and inserting his allies in key positions, said current and former officials. In the administration's internal discussions, Defense Secretary James Mattis — who was also absent from the Friday meeting — and Secretary of State Mike Pompeo had consistently opposed reducing the ceiling for how many refugees could be allowed into the country next fiscal year, former officials, humanitarian experts and congressional staffers from both parties told NBC News. But after the meeting of top officials at the White House, Pompeo unveiled plans Monday to scale back the cap for refugees in 2019 to its lowest level since 1980. The secretary gave no explanation as to why he had changed his position, or how that number was arrived at during the closed door "principals" meeting. Lawmakers from both parties, and some Christian charities, had urged Pompeo to stand firm against yet another reduction in refugee admissions, arguing it would undermine relations with allies, fuel instability in volatile regions and damage America's image. In a joint statement Wednesday, Republican Rep. Randy Hultgren of Illinois and Democratic Rep. Jim McGovern of Massachusetts expressed "extreme disappointment at the administration's proposal," and added, "We cannot turn our back on the international community in a time of historic need." Sen. Bob Menendez of New Jersey, the ranking Democrat on the Senate Foreign Relations Committee, said Monday he was "very concerned to see Secretary Pompeo was either not willing or unable to be a voice of reason in the room when the president was told he should continue grinding the U.S refugee program to a halt." Former officials said it appeared the top diplomat bowed to Miller and others pressing for scaling back refugee resettlement. "Pompeo got rolled," said one former official familiar with the deliberations who served under Republican and Democratic administrations. The secretary "got manhandled by a kid who knows nothing about foreign policy," said the source, referring to the 33-year-old Miller. The State Department did not respond directly to questions about why Pompeo apparently altered his stance. But a spokesperson said the recommendation, which still must be approved by the president, takes into account additional security vetting procedures for refugee applications as well as the need to manage nearly 300,000 asylum cases. Over the past several months, former officials and humanitarian organizations say, Miller restricted who would take part in the deliberations, while ensuring like-minded associates were in key positions at the State Department. Unlike last year's deliberations on refugees, Haley and her office were excluded from the inter-agency discussions on the issue and did not attend last Friday's meeting where the cap was set, even though her staff argued she should be included, current and former officials said. Although Haley's office was not invited into the discussions, the ambassador "provided our views during the process," a spokesperson for the U.S. mission at the UN told NBC News. Haley had previously opposed drastic reductions in refugee resettlement numbers. Paving the way for Miller, an official at the National Security Council, Jennifer Arangio, a political appointee who worked on President Donald Trump's campaign, was fired and escorted from her office in July after clashing with Miller over refugee-related issues. And two refugee skeptics aligned with Miller are now in senior positions at the State Department: Andrew Veprek at the Bureau for Population, Refugees and Migration and John Zadrozny at the policy planning office. The State Department declined to disclose which agencies or officials attended the final interagency discussions, but a spokesperson said the plan was arrived at "in consultation with all appropriate government agencies." It was not clear if the Office of Refugee Resettlement, which is part of the Department of Health and Human Services and provides cash payments and medical assistance to newly arrived refugees, was invited to the inter-agency process. A spokesperson said ORR took part in "the discussion" on the issue but did not say specifically if the office had a seat at the table in the inter-agency deliberations. The White House meeting last Friday was classified and limited to only a small number of senior officials and cabinet members. Those restrictions are usually reserved for more sensitive issues involving military action or intelligence, former officials said. The limits played in Miller's favor, as cabinet members and their deputies could not divulge details of the discussion. Mattis did not attend the meeting in person and provided his opinion in writing, Pentagon spokeswoman Dana White said. She added that "as the information and discussion were classified, I cannot provide further comment." Based on the administration's public statements on the issue, Miller also appeared to succeed in framing the refugee issue on his terms. When Pompeo announced the plan to reporters at the State Department this week, he echoed arguments that Miller and his supporters have often employed to defend drastic restrictions on refugees. Pompeo said that the government lacked the manpower to handle more refugees, that the U.S. was focused on providing aid abroad where refugees are located and that refugee numbers needed to be limited to safeguard the country's national security. "He was using Miller's talking points," another former official who served in both Republican and Democratic administrations said. With the world facing the worst refugee crisis since World War II, the recommendation to slash refugee numbers was widely condemned by humanitarian organizations and rights groups. Pompeo's announcement is "appalling, and it continues this administration's rapid flight from the proud U.S. tradition of providing refuge to those fleeing persecution around the world," said Eric Schwartz, president of Refugees International, who oversaw refugee policy at the State Department. Those who share Miller's views on immigration say he is portrayed unfairly by his critics. They maintain he is merely a successful advocate for Trump, who promised as a candidate to clamp down on immigration and temporarily halt Muslims from entering the country. "As I understand it, Miller is zealously promoting his boss's agenda within the administration, and running up against people who are less committed to that agenda," said Mark Krikorian of the Center for Immigration Studies, which has backed the administration's stance on immigration. "He seems to be pretty effective at navigating bureaucratic politics, which is an essential skill if you want to get anything done." In a tumultuous White House, Miller is one of a handful of original Trump loyalists who has survived and thrived, exerting an outsize influence over immigration decisions and rhetoric. One administration official, who was not authorized to speak on the record, said it should not be surprising that so many of Miller's ideas have come to fruition. "Miller has survived and people who think like Miller have survived because the president agrees with these policies. He is not running a rogue operation," the official told NBC News. Miller was once part of a small group of outsiders working as staffers on Capitol Hill who backed an aggressive line on immigration but often found themselves out of favor with the Republican Party establishment. 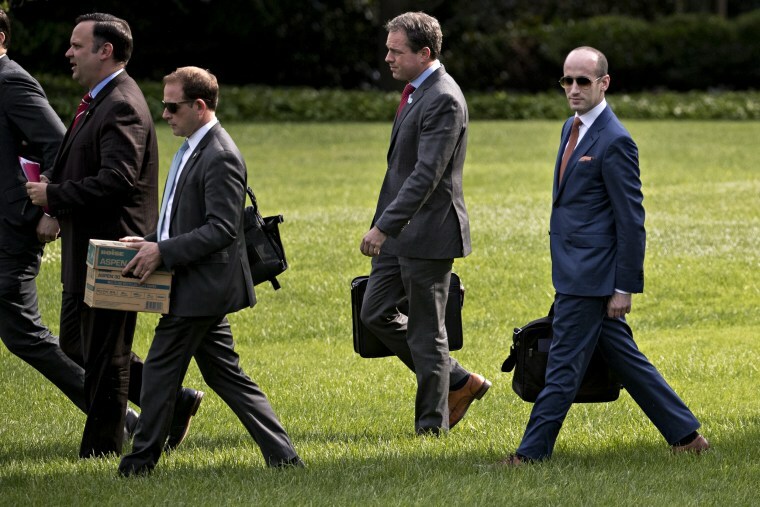 Many of those former colleagues are now deployed throughout the administration and have helped design and carry out some of Miller's most sweeping and contentious policies, including a ban on travel from certain countries, a higher bar for proving asylum, a reduction in refugee admissions and the separation of migrant parents from their children at the border. Miller and his allies have even promoted the creation of a denaturalization task force, which is supposed to ferret out people who lied on their applications and to strip them of their citizenship. Critics say Miller is overseeing a systematic attack on all forms of immigration, illegal and legal, by promoting an underlying idea that foreign-born citizens or immigrants represent a dangerous threat to the country. "I think he's going to go down in history having a lot of blood on his hands. He is driving the most nativist agenda we have seen in 100 years," said Frank Sharry, executive director of America's Voice, an immigration reform advocacy group in Washington. "But he has had mixed results." Some of those mixed results include the legal blowback on the travel ban, which went through three versions before finally holding up in federal court. Miller also pushed for the end of DACA, the program designed to help children brought to the country illegally by their parents to remain in the U.S. But courts have stopped the administration from taking away those rights. The most hard-line measures have also proved politically unpopular, according to opinion polls, with large majorities of American voters voicing opposition to ending DACA or detaining children separately from relatives entering the country illegally.